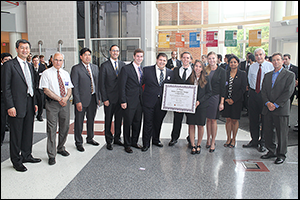 Members of the BioE Class of 2014 with their mentors, BioE faculty and Capstone judges. 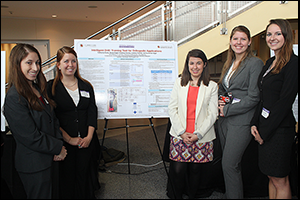 Demonstrating firsthand bioengineering's enormous potential to change lives, the Fischell Department of Bioengineering (BioE) 2014 Senior Capstone class exhibited a total of 16 novel concepts during the Capstone II finale on May 14, 2014. 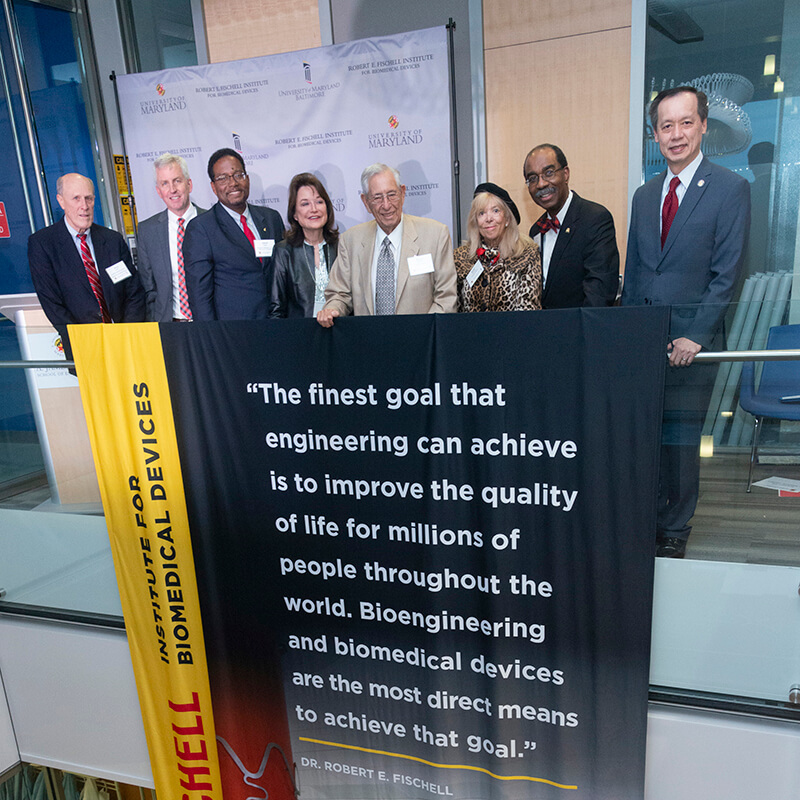 With projects ranging from a customizable 3D tissue-engineering scaffold and an intelligent drill for orthopedic applications, to a carbon monoxide sensor for cars and a smart phone display interference for the driver seat while a car is in motion, this year’s showcase demonstrated how bioengineering impacts everyday life. 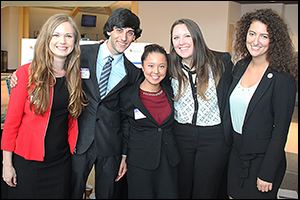 Even more, the 2014 Capstone Design Competition marked the biggest yet, as 81 students pitched their products to a panel of esteemed judges, as well as to BioE faculty and fellow students. 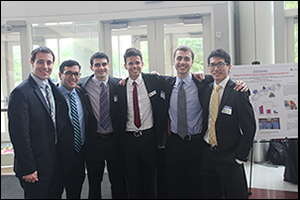 Created and sponsored by Mrs. Susan Fischell, wife of Clark School benefactor Dr. Robert E. Fischell, the Capstone Design Competition has been a marquee event, capping off the end of the academic year. Osteoarthritis is a bone and cartilage degenerative disease that affects more than 26.9 million adults in the United States. This disease leads to a systematic breakdown of cartilage and bone tissues in the joints – primarily in the knee, hip and ankle joints – and can increase in joint stiffness and pain. Osteochondral lesions are one of the many complications associated with osteoarthritis, and are the cause of at least 35 percent of all total arthritis-related joint replacements in the United States. 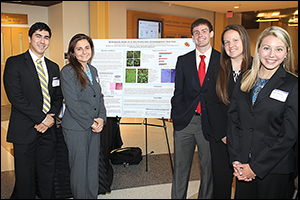 Recognizing there is no cure for osteoarthritis, Team 1 set out to design a customizable three-dimensional tissue-engineering scaffold that supports full thickness osteochondral defect repair in joints with mechanical instability. As such, Team 1’s “OCD Repair Kit” contains their patient-specific 3D-Printed OXPEKK® (Oxford Performance Materials) synthetic scaffold, a source of human cartilaginous tissue: DeNovo® NT Natural Tissue Graft (Zimmer), a patient-specific surgical jig, fibrin glue, and supporting documentation. The scaffold is made up of synthetic biocompatible material that is primarily used as structural support through the scaffold's trabecular features. This allows for the scaffold to withstand maximum loading, while keeping a hollow inner space where the biologic component can be loaded. Medical imaging is used to determine the exact physical dimensions and location of an afflicted joint’s lesion, and the information is inputted into computer aided design (CAD) software to construct a custom-designed scaffold via 3D-printing for use in filling and treating the lesion. 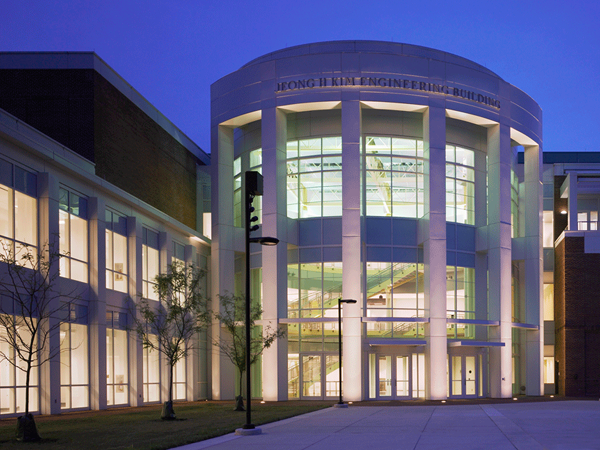 The system is expected to be a Class III Medical Device and would require a Premarket Approval by the Food and Drug Administration, as well as pertinent clinical trials. In 2005, nearly 90 percent of the 4.4 million ICU patients were on urinary catheters. In order to monitor kidney and digestive health, urine is typically collected for 24 hours, sent to a lab for processing, and the results are then sent to a physician for analysis. But, this time lag allows disease states to progress, unnoticed and untreated for up to 30 hours. 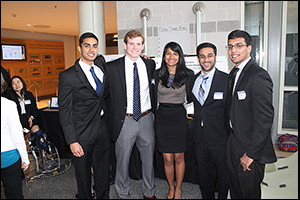 Recognizing the potential adverse impact this delay could have on a patient's health, Team 2 developed a prototype of a real-time, point-of-care human metabolic sensor for ICU patients with urinary catheters. The device measures urea, which is the primary form of nitrogenous waste from the human body, and creatinine, a primary product of muscle metabolism and catabolism. Knowing the concentration of these two analytes can provide insight into kidney health, protein absorption and muscle breakdown, Team 2 said. As opposed to current methods, Team 2’s device gets a measurement every 15 minutes, estimates the 24-hour values, and completes some of the analysis. It does so by following an innovative process, whereby the patient urinates at a constant rate into a modified Foley catheter. The urine is diverted into this C-bend, where it then flows into Team 2's device and into a urine vial. When it reaches a certain volume level inside the urine vial, a sensor is set off, opening the pinch valve for a set time period. This triggers the gateway from the catheter to close, and the reagents to flow into the reaction chambers. The system undergoes two major reactions – the Jaffe reaction for creatinine and the Berthelot reaction for urea – and the device finishes its reactions to produce two distinctly colored products. 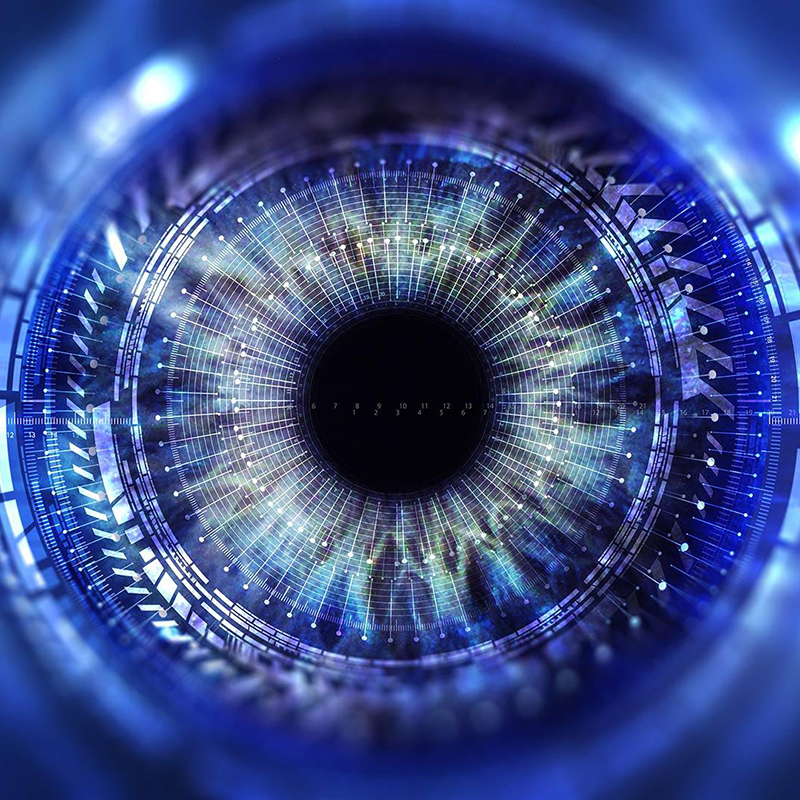 In future versions of the device, the team plans to incorporate a spectrophotometer to graph each data point as it appears as concentration versus time, providing values for some clinically relevant pieces of data. According to the American Heart Association Statistic Committee and Stroke Statistics Subcommittee, there are 568,400 instances of cardiac arrest each year. In these instances, emergency medical providers must manually check for a patient’s pulse to ensure that there is no pulsatile blood flow before continuing with CPR or electrical defibrillation. In a stressful environment, using fingers to detect a pulse can be inaccurate and time-consuming due to difficulty in locating an artery and distinguishing a patient’s pulse from the medical provider’s own. 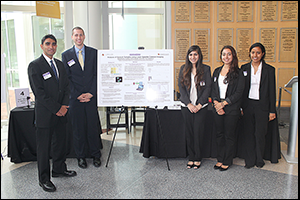 In efforts to prevent errors associated with avoidable defibrillation, Team 3 designed a device to adhere to the patient to provide hands-free, continuous pulse monitoring within the 10 seconds allotted to detect a pulse. Featuring a disposable ultrasound patch that can be applied over critical arteries and attached or detached from a light, hand-held LCD screen connected by an audio cable, the team’s device allows the first responder to apply and leave the patch with the patient throughout their transfer to and within the hospital. Thus, signals from one patient’s patch can be read by multiple units, Team 3 said. In addition to locating a pulse prior to administering defibrillation, the patch can remain on the patient through CPR to evaluate the effectiveness of compressions. As such, the team believes increased certainty of pulse flow and compression effectiveness will increase cardiac arrest survival rates. Sputum induction and analysis has been considered a valuable sampling method for diagnosing and monitoring many pulmonary diseases including asthma, chronic obstructive pulmonary disease (COPD), and interstitial lung disease. Current methods of sputum sampling are qualitative and based on physiological and mechanical properties – namely, color and consistency. Analyzing color means determining the presence of white blood cells called neutrophillic granulocytes. Myeloperoxidase (MPO) is an enzyme abundantly expressed in neutrophil granulocytes, and increased MPO is signified by a green color. Consistency analysis involves determining viscosity and elasticity. In cystic fibrosis and COPD, for example, there is reduced water content and an increased fraction of glycoproteins associated with an increase in the sputum's viscoelasticity. 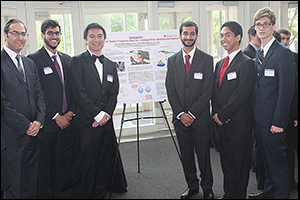 Team 3 developed a technique to analyze the mechanical properties of sputum using a low-cost Laser Speckle Contrast Imaging modality. To determine the absorbance readings of MPO in sputum samples, they used a DU-800 Scanning Spectrophotometer to analyze the peak absorbance values. They measured the concentration of neutrophils, polymorphonuclear leukocytes, and analyzed sputum at four different concentrations of PMNs: 0, 3 million, 10 million and 30 million cells/µL. The team also mixed red dye with glycerol to imitate blood suspended in sputum, and they added particles of sand to the samples to generate scattering in the viscous media and create speckle images. Often, cardiac abnormalities that cannot be detected by magnetic resonance imaging (MRI) while at rest are clearly visible during cardiovascular disease; however, limitations on the motion of the lower extremities imposed during cardiac catheterization procedures render exercise impossible using current lower-body exercise devices, such as treadmills and bicycle ergometers. Moreover, existing devices do not utilize continuous feedback control of the exercise workload based on heart rate, thereby decreasing the likelihood that the patient will reach an ideal level of physiological provocation for imaging. 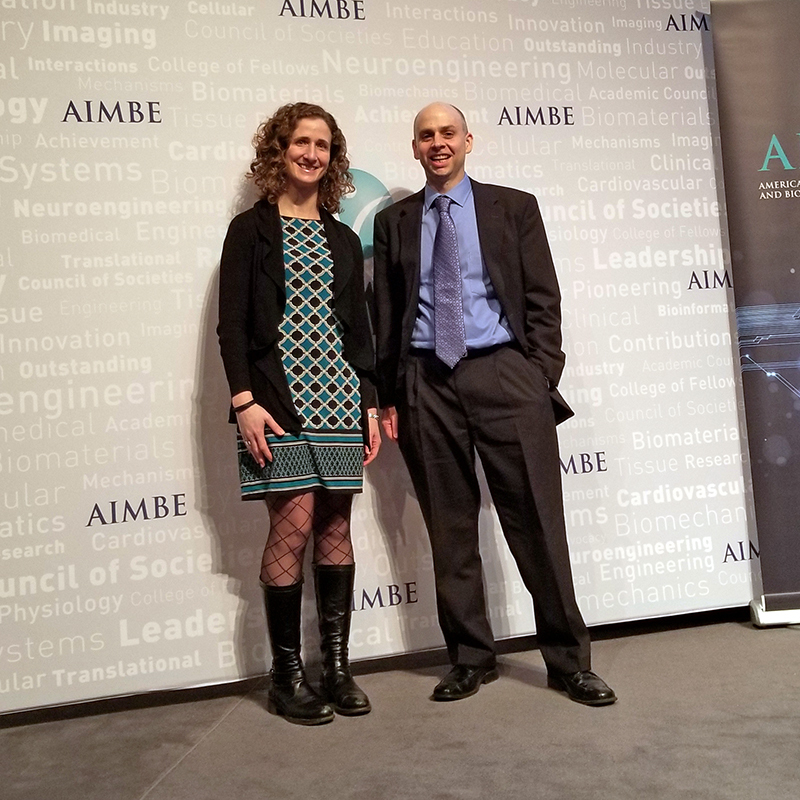 With this in mind, Team 5 has developed an adaptive, MRI-compatible upper-body exercise device for use during cardiac catheterization under whole-body MRI. The exercise apparatus utilizes an up/down pulling motion for the arms with variable resistance provided by a pneumatic piston-cylinder system and controlled through a feedback algorithm based on the patient’s heart rate relative to a set target. Drilling accuracy and resisting plunging – sudden acceleration of the drill as a result of a decrease in bone density – are two of the most important and most difficult skills for orthopedic residents to master when in training. Current orthopedic training programs follow an apprenticeship model, and residents practice their orthopedic drilling skills in the OR with a mentor, which can take a great deal of training time and pose a risk to both patients and surgeons. Additionally, a major challenge in orthopedic surgery is the need to place wires and screws accurately with little guidance, Team 6 said. That is why the team recently developed a device to lower patient risk by quantifying residents’ skill level. Along with the training device itself, residents can use specially designed software that analyzes their drilling progress over longer periods of time and allows for proficiency testing. Using an LED light panel that provides directional feedback from the accelerometer and microprocessor as the resident is drilling, the intelligent drill device measures the angle at which the resident approaches the target coordinates. If the drilling angle deviates from the target, the LED corresponding to the opposite direction will light red until the user tilts the drill in the direction of the lit LED to correct the angle. Team 6 tested their device and devised a plan to improve LED accuracy and sensitivity and to ensure greater accuracy by revising placement of the accelerometer on the drill. Moving forward, the group plans to conduct long-term testing and real-time tracking of drilling accuracy. Tracheal occlusion occurs due to stenosis – or blockages – of the trachea, often caused by either scar tissue formation from physical trauma or squamous cell carcinomas that have a 12.6 percent five-year survival rate. Stenting of the airways is the foremost method for maintaining tracheal integrity after the removal of the stenosis and, considering the effectiveness of the stenting process and the ease of implantation, endotracheal stents (ES) are the preferred treatment method for preventing tracheal collapse after surgery. But, current silicone ES implantation poses two main challenges: stent migration and inefficient stent removal. 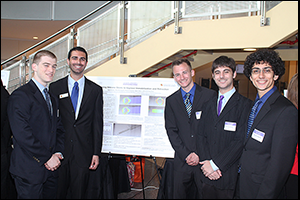 In efforts to overcome these challenges, Team 6 developed and prototyped a stent with unique bidirectional fins to prevent migration and a novel retraction device for quick and uniform stent removal. Dengue fever, a mosquito-borne tropical disease caused by an RNA virus, affects up to 600,000 people worldwide each year. 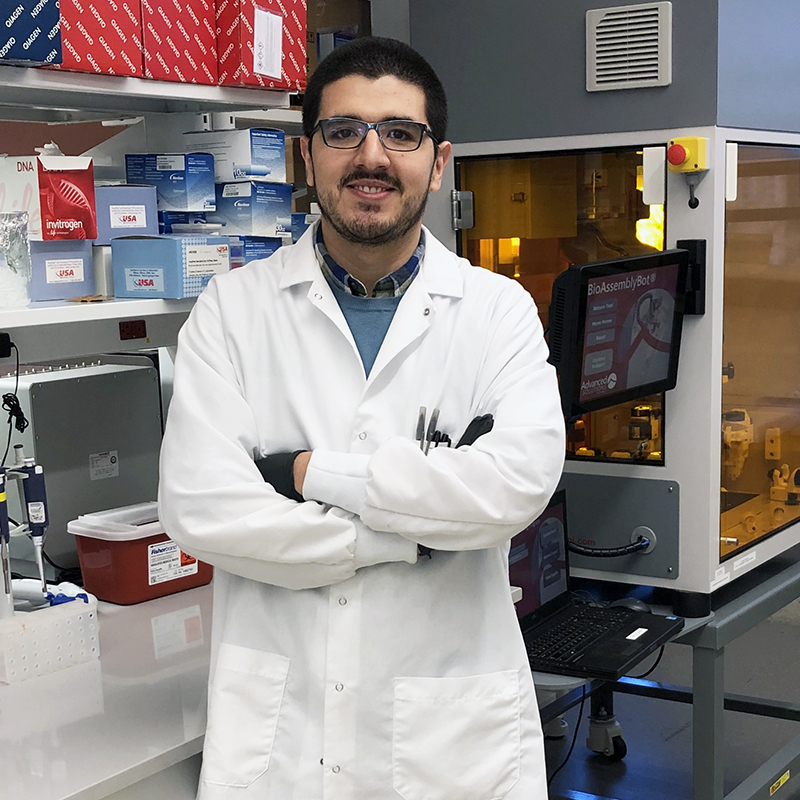 While current diagnostic tools require expensive equipment and are time-consuming to use, Team 8 recently has worked to develop a detection assay that is able to specifically detect dengue virus RNA and can be used in low-resource settings without complicated equipment or trained professionals. Even more, the team has worked to devise a detection technique that can be performed in under an hour. Their device is comprised of a displacement reaction vessel, colorimetric filtration vessel and a heater that utilizes an Arduino. 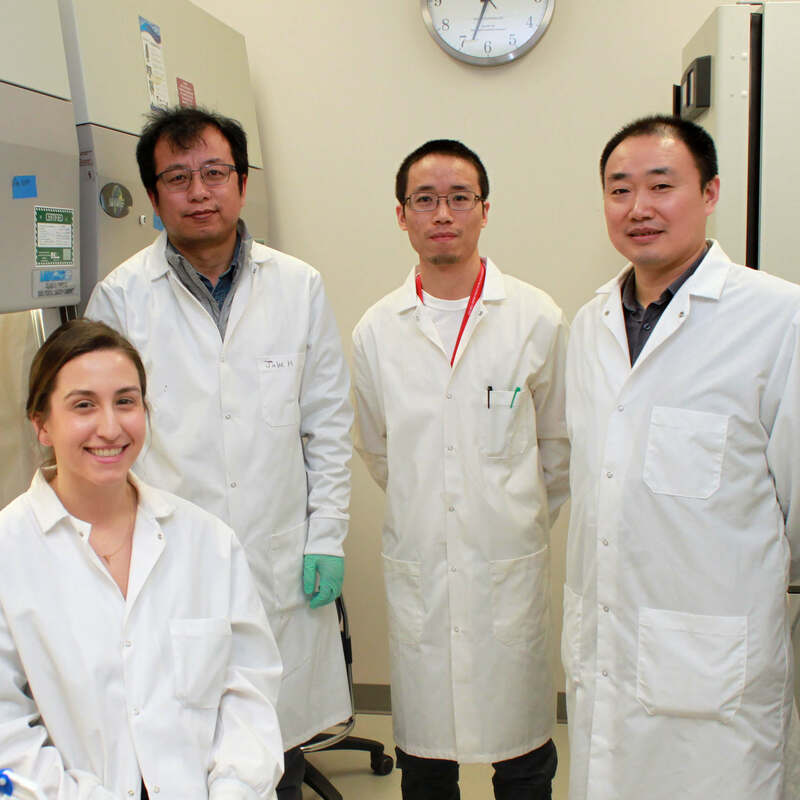 Results proved the device to be effective in detecting viral RNA in a limited resource setting, and the team believes it can also be used to detect specific RNA or DNA sequences of other viruses. The endotracheal tube is a vital part of many medical procedures – it maintains an open passageway that allows for unobstructed flow of air and supply of oxygen to the lungs during surgery and long-term recovery. In the United States, endotracheal tubes are made of polyvinyl chloride (PVC), nylon, Teflon, or silicone rubber, which are fairly flexible plastics, of varying diameters to allow for the appropriate fit in a variety of patients and conditions. But, endotracheal tubes have largely undergone little to no improvements in recent decades, Team 9 noted. And, endotracheal tubes present a number of potential complications. First, patients often subconsciously bite down on the tube, occluding the flow of oxygen. Also, to confirm the correct positioning of the tube, physicians have to take daily x-ray images of the patient’s torso. And, intubation is often a complex process because it is difficult to guide the tube through the tight vocal cord space. 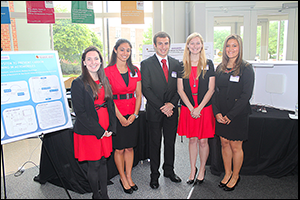 To address these challenges, Team 9 developed an endotracheal tube that incorporates a hollow cylinder of hard plastic designed to be embedded in the wall of the tube to prevent patients from closing the tube by biting down. Team 9’s endotracheal tube also incorporates a double lumen system to allow for daily tests and easier location of the tube, eliminating long-term, frequent exposure to x-rays. Furthermore, Team 9’s device includes a modified stylet that uses electromagnets and copper wires to improve the intubation process. As such, their improved endotracheal tube seeks to ensure constant sufficient oxygen supply, provide ultrasound detectability, and enhance patient comfort and safety. Treatment for chronic myelogenous leukemia (CML) – a disease in which the bone marrow makes too many white blood cells – typically involves a bone marrow transplant. In fact, roughly 60-80 percent of CML patients make a full recovery after receiving this treatment, according to a report issued by Vanderbilt University Medical Center. As such, hematopoietic stem cell (HSC) transplantation with bone marrow is a proven treatment for CML. 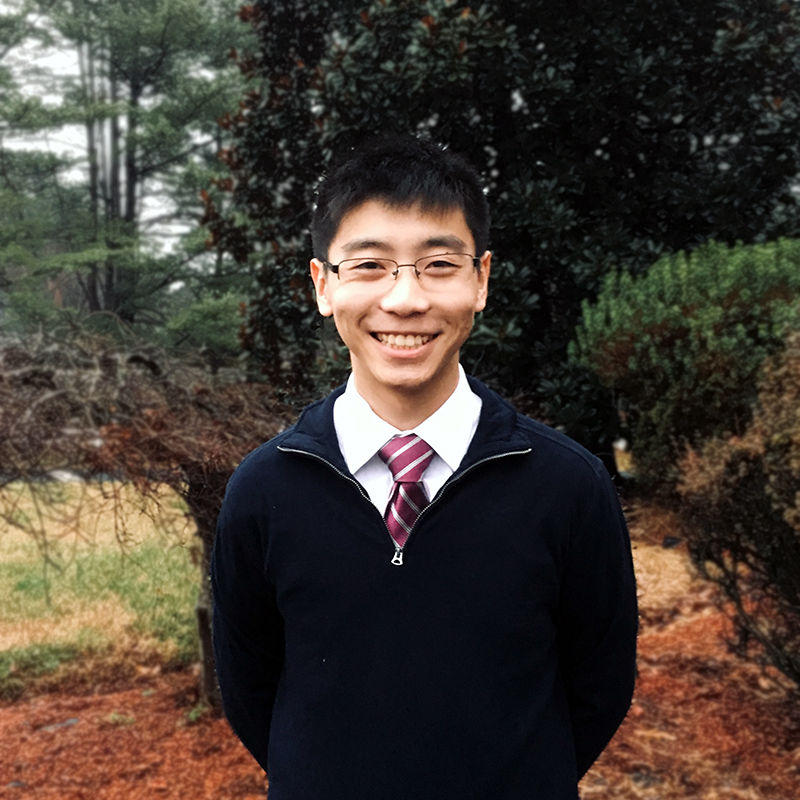 But, through ex vivo expansion of HSCs, Team 10 aims to help reduce the costs typically associated with bone marrow transplants, which can amount to upwards of $200,000. For the design of their in vitro expansion system, Team 10 developed a scaffold for the co-culture of human mesenchymal stem cells (hMSCs) and HSCs to facilitate HSC proliferation and self-renewal. Although several inventions have been described to expand HSCs, such devices rely on a 2D culture and expensive cell signaling molecules, the team said. In contrast, their design increases HSC function due to the 3D body-like environment. 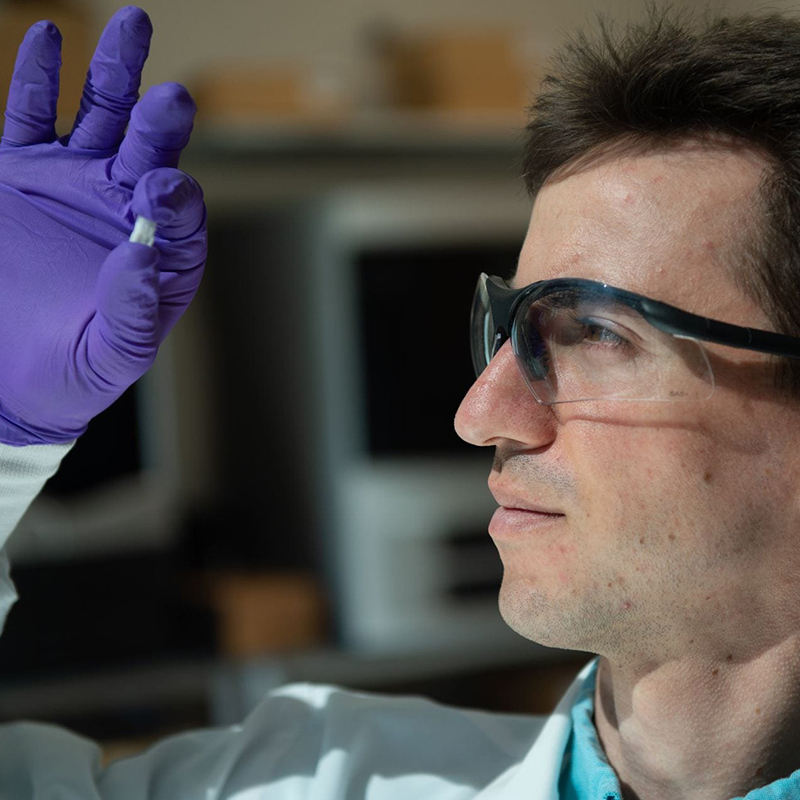 Additionally, via 3D-printed molds, the team is able to fabricate each scaffold with polydimethylsiloxane (PDMS), which is both cost-efficient and translucent for imaging. 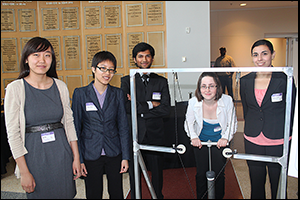 Trials reveal that the team’s scaffold could be used to form co-cultures with 3D structures, and the members of the team have filed a provisional patent on their design. Ankle injuries account for more than 1 million visits to the emergency every year, and, according to a report filed by the American College of Sports Medicine, more than 40 percent of ankle injuries are poorly treated and/or misdiagnosed. Today, medical practitioners largely rely on subjective visual and physical observation to diagnose injuries and record improvement, Team 11 said. As such, the team set out to design and prototype a device to measure ankle range of motion and force output – two parameters important to clinical assessment of ankle function. 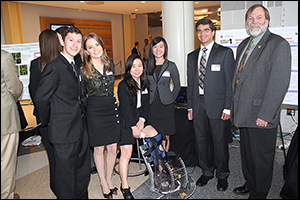 The device they developed involves a mechanical framework into which the patient can move his or her ankle. The team also incorporated electrical components into the device to measure ankle range of motion and force output, and the instrumentation also includes linking the sensors to a computer for processing and visualization of the patient data. This design allows the user to test the strength and function of the patient’s ankle tendons, and it is made with clear materials to allow orthopedic professionals to see the movements of the foot. Decubitus ulcers, commonly referred to as pressure sores or bedsores, occur from prolonged periods of pressure applied to soft tissue by an external force, such as a wheelchair pad, mattress or bed rail. The pressure obstructs blood flow to the soft tissue, preventing oxygenation. And, according to Team 12, pressure sores pose great dangers and are a major problem, particularly for bedridden patients in home care facilities. Currently, there are many treatment options and devices; but, Team 12 has developed a device that overcomes many of the challenges current options fail to resolve. 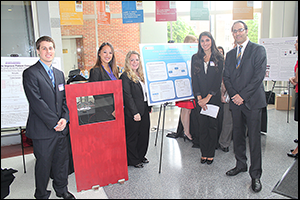 Using a novel oscillating thermoplastic cradle to keep patients in constant motion and prevent the pooling of blood, Team 12 has developed a mechanical and autonomous bed at low cost. Using a common rotation technique, the team’s invention eliminates the development of pressure sores by autonomously rocking the patient’s body to shift pressure of his or her shoulder blades and scarum. Studies have shown that rotation of a patient every two hours can prevent the development of pressure sores, the team members said, noting that their device’s unique U-shaped cradle will aid in patient safety by reducing the likelihood of a patient falling off the bed. Even more, this cradle helps with the effectiveness of bedsore prevention by distributing pressure evenly, lessening the chance of sore development at pressure points. Communication in a clinical setting is key; however, communication with patients who are unable to speak or otherwise convey a message can be difficult. 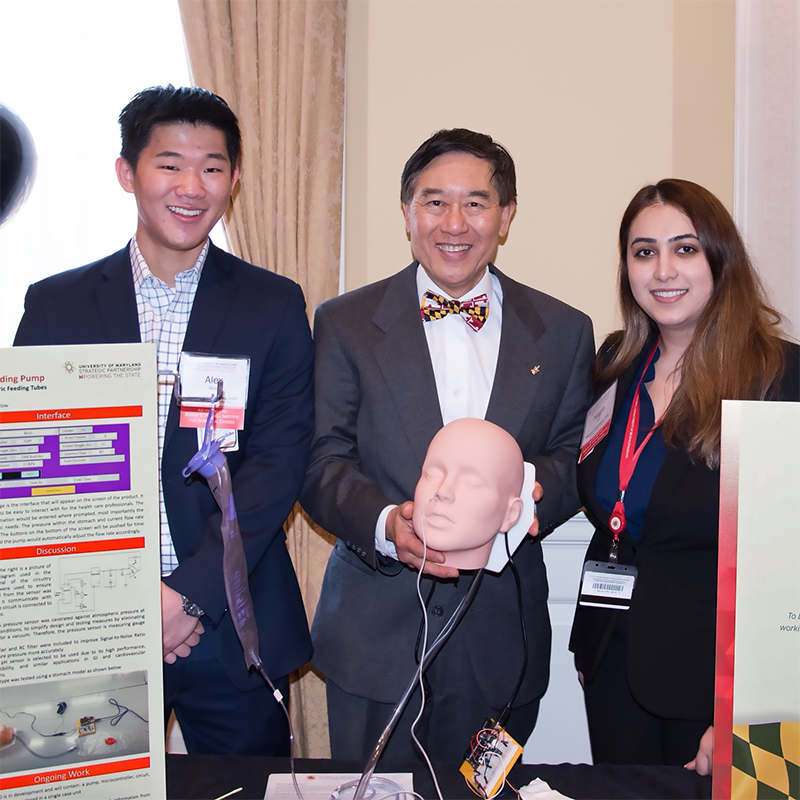 With this in mind, Team 13 has worked to develop a device that allows patients to easily communicate with clinicians via the tracking of small head movements. Their device has three primary components: a headband, a soft keyboard and a monitor. The headband carries an infrared LED, allowing the patient to project an infrared light towards the sensor. The soft keyboard, in turn, acts as a virtual construct that displays the standard ‘QWERTY’ keyboard on the monitor, allowing the patient to scroll over the keys using a motion-controller cursor. After hovering the cursor over a key for a period of one second, the key will be selected and will output the character in the display box above the keyboard for clinicians and others to read. Carbon monoxide (CO) is an odorless, poisonous gas that binds to red blood cells faster than oxygen, resulting in oxygen-depleted tissues in the body. According to Team 14, exposure above 70 ppm becomes dangerous, and prolonged exposure above 150 ppm leads to disorientation, unconsciousness and death. In fact, in the United States, more than 400 deaths result from unintentional CO poisoning each year. Knowing this, Team 14 developed a diagram of a CO sensor circuit, through which CO levels in the car could be measured. At 70 ppm CO, audible and visual alarms are activated within the car, and, at 150 ppm CO, the car’s windows would roll down for five seconds to vent. The team hopes that, in the future, CO sensors in automobiles will be required. Recognizing that sleep insufficiency is often linked to a number of medical problems and viewed as a contributor to motor vehicle crashes, industrial disasters and occupational errors, Team 15 researched circadian rhythm – a system whereby an internal mechanism in the body is synchronized with the light-dark cycle and other environmental cues, yet persists even in the absence of cues indicating the time or length of day. 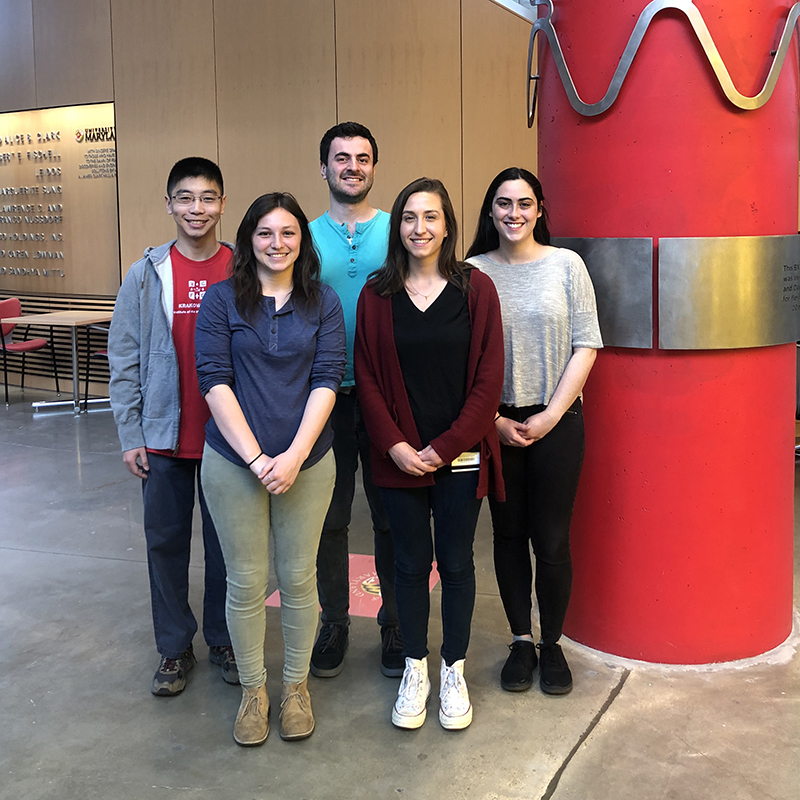 While several methods have been used to monitor circadian rhythm, Team 15 has proposed a non-invasive sensor that can be worn for extended periods of time in order to continuously measure a patient’s core body temperature during both day and night. The sensor relays data gathered from the patient nd sends it to an Arduino microcontroller. This, along with the patient’s history of behavior and habits, is used to help diagnose sleep disorders such as delayed sleep phase and insomnia. Use of smartphones contributes to 1.6 million car accidents – approximately 23 percent of all accidents – in the United States, Team 16 noted. That is why Team 16 designed a device to prevent drivers from having the ability to text while the car is in motion. Recognizing that ultra-high frequency technologies allow for short transmission of radio signals at high frequencies with the lowest possibility of interference, the group chose a system that incorporates Cottonwood UHF RFID readers, which connect to their respective 902-928 MHz antennae. The readers also connect to an Arduino Mega that has the capability of processing multiple readers and supporting multiple serial ports. A dual frequency RFID card tag is physically attached to the phone to transmit radio signal, and the three readers detect the radio signal from the tag and communicate with the Mega. A custom smart phone application communicates with the Mega via Bluetooth and GPS to determine speed. If the vehicle is traveling above a preset velocity, the app disables the screen of the phone. 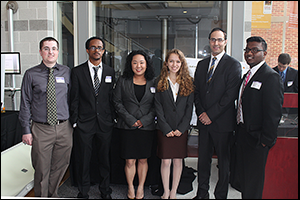 The Fischell Department of Bioengineering would like to congratulate all who participated in this year's Senior Capstone Design Competition and wish the Class of 2014 the best of luck in all future endeavors. 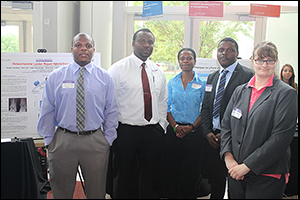 The 2014 First Place team, Team 3 (Ultrasound Pulse Monitor for Continuous Monitoring of Blood Flow during Instances of Cardiac Arrest) with the judges. 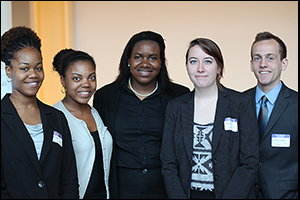 The 2014 BioE seniors would like to thank their professors and mentors (listed with their Capstone teams above); lab staff including Melvin Hill for guidance, time, and labor; administrative staff members for help with financial support and purchasing; Professors Yang Tao and William E. Bentley; the 2014 judges; and friends in outside academia and industry for the advice and supplies they donated that helped these projects succeed. 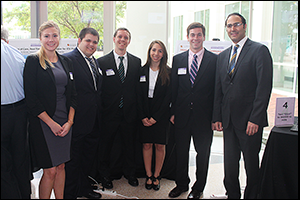 View the full 2014 Capstone Design Competition photo gallery.